Friends Home & Village - Times Publishing Newspapers, Inc. Since 1897, character and caring. 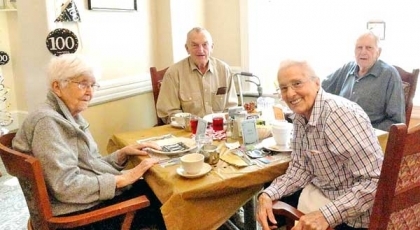 That’s what Friends Home & Village has endeavored to provide its residents for over 120 years. The non-profit community, open to seniors of all backgrounds, offers an affordable and meaningful retirement experience on two campuses in historic Newtown. With a mission to provide moderately priced, small-community retirement living in a caring environment, Friends Home & Village strives to allow seniors over the age of 62 to live a life enriched by community support, while preserving retirement savings for future needs. With independent living apartments as well as personal care rooms, the Paxson campus of Friends Home & Village stands at the very heart of historic Newtown borough, just two short blocks from State Street. In continuous operation since its opening in 1897, the Paxson campus offers its residents supportive care as well as close access to all that Newtown has to offer such as shopping, dining, and theatre. In 1983, the Styer campus of Friends Home & Village opened because of the generosity of the Styer family, who donated their stone farmhouse and seven acres of its surrounding orchard with a vision that independent seniors might enjoy living in a supportive, active community. With independent living apartments in a variety of sizes, the Styer campus offers a garden-like community on Lower Dolington Road, just a short distance from Newtown borough. At Friends Home & Village, inspiration comes from the exceptional group of people who live, work and volunteer there. Its residents served the Newtown area as teachers, small business owners, first responders and caregivers. Founded by Quaker values, Friends Home & Village remains committed to the heritage of honoring the importance of recognizing and appreciating each person for who they are now, at this moment. As a small community, staff have the opportunity to get to know each resident personally, while striving to offer exceptional services, such as activities, meals, housekeeping, transportation, and security. Getting older can be a challenging experience; it requires courage, a healthy dose of good humor and dependable support. Friends Home & Village aims to provide a safe, secure and welcoming environment where everyone ages well together. To learn more about Friends Home & Village, or to take a tour, call 215-968-3346 or e-mail info@fhvpa.org. Service and rate information can be found online at www.fhvpa.org.